A Net is a two-dimensional figure that can be folded into a three-dimensional object. making 3-D solids from given nets. Exclude nets of cylinder and cone. 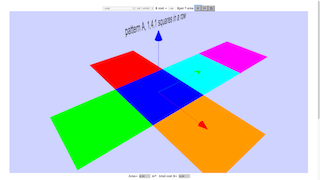 according to http://donsteward.blogspot.sg/2013/05/nets-of-cuboid.html there are 54 ways for nets of cuboid to form a 3D object. https://illuminations.nctm.org/activity.aspx?id=3544 by the National Council of Teachers of Mathematics (NCTM). http://www.nctm.org/Classroom-Resources/Interactives/Cube-Nets/ by the National Council of Teachers of Mathematics (NCTM).